There were some new abilities/buffs added for equipment in the new DLC. The highest tier of equipment now has these "runewords" as the first buff. These Runewords basically include multiple buffs inside them (the buffs inside them are fixed and tied to specific runewords). There are about a 100 Runewords, and I've listed them in below link. Sorry for the double post, but we've started a little spreadsheet to document the various effects each runeword has. 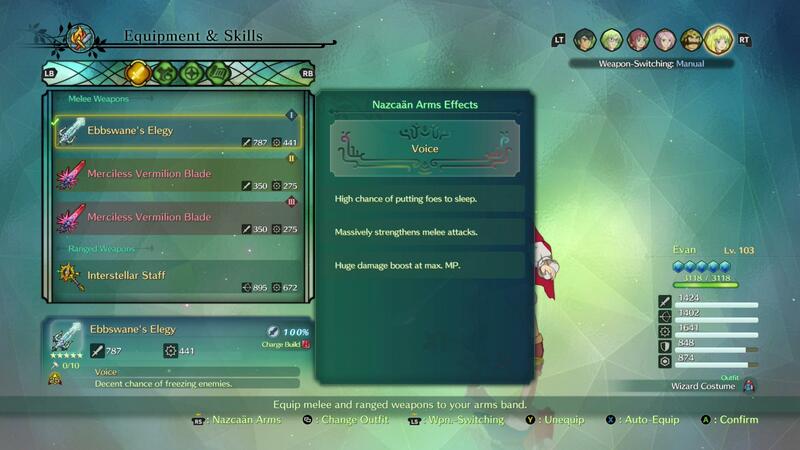 In the game these are called as Nazcaan Arms Effects. Below are the ids for all the gold equipment and new buffs I've found so far. I've written them in a format that you can directly add to your shop dropdown list, which will allow you to select these under "Choose an item". Does anyone know of a way for finding ALL the gold equipment ids? Sorry, I haven't been playing the game, but I added the items and buff's you found, Anacra. Thanks. EDIT 17.2. For anyone that is still playing, if you come across new gold equipment, please post the name and id of that equipment here. It's easy to do this via highlighting the equipment in-game and then seeing the "ID" number in the cheat table under Equipment Editor. This way we'll hopefully get closer to a complete list. 2250495395 Lots likier to inflict status ailments. 1189022856 Zing Gauge increases a bit more quickly. 2112288465 Boosts Hammer Damage a little. 662995847 Boosts Critical Hit Damage. 2452291018 Damage Boost when ailment in effect. Updating and merging the buff list from the one i found. will update if i come across some new value. 1329015934:Att. and def. boosted vs. Horned One. 4131284032:Big dmg. boost vs. brutal monsters. 1017204753:Big dmg. boost vs. dragons. 1519070028:Big dmg. boost vs. elite soldiers. 1757235662:Big dmg. boost vs. fairy monsters. 395051986:Big dmg. boost vs. nature monsters. 1944110806:Big dmg. boost vs. slimy monsters. 215059658:Big dmg. boost vs. soldiers. 1104585812:Big dmg. boost vs. solid monsters. 3982748504:Big dmg. boost vs. tainted monsters. 455816609:Boosts damage done by bows. 805725794:Boosts damage done by firearms. 4204352051:Boosts damage done by hammers. 3816973170:Boosts damage done by spears. 1679458237:Boosts damage done by swords. 689788707:Boosts damage done by wands. 2925720513:Boosts damage done by bows a little. 66219735:Boosts MP restored by melee attacks. 1437124945:Boosts MP restored by ranged attacks. 594271206:Boosts resistance to all ailments. 1340211562:Charged attacks build more quickly. 1531527547:Charged attacks build more quickly. 179871410:Curse greatly increases damage taken. 329494515:Curse greatly reduces damage dealt. 2109713956:Curse increases damage taken a fair bit. 1688510309:Curse reduces damage dealt a fair bit. 3837198238:Curse slightly increases damage taken. 4256026335:Curse slightly reduces damage dealt. 3355060515:Curse unlocked with DLC purchase. 3973544672:Curse unlocked with DLC purchase. 4123806625:Curse unlocked with DLC purchase. 1708660106:Damage boost when ailment in effect. 2452291018:Damage boost when ailment in effect. 3872224759:Decent chance of confusing enemies. 472030589:Decent chance of freezing enemies. 4254137071:Decent chance of poisoning enemies. 1398999994:Decent chance of putting foes to sleep. 3853392308:Decent damage boost at max. MP. 3804487085:Decent damage boost when HP is low. 3585925564:Defense boosted when HP low. 1378155891:Defense greatly boosted when HP low. 1977212335:Enemies drop more high-grade items. 1977587129:Greatly boosts all elemental resistances. 2093163723:Greatly boosts critical hit damage. 2957180773:Greatly boosts critical hit damage. 2603615406:Greatly boosts Exp. earned up to Lv. 10. 276263580:Greatly boosts money dropped by foes. 1416424304:Greatly boosts resistance to all ailments. 2682441748:Greatly boosts resistance to all ailments. 2604604748:Greatly boosts resistance to confusion. 2723494131:Greatly boosts resistance to freezing. 4283684936:Greatly boosts resistance to nixing. 1501084238:Greatly boosts resistance to poison. 3325689335:Greatly boosts resistance to sleep. 641643838:Hangs on with 1 HP after a big hit. 36701408:Higgledy balls heal HP a little. 1299288615:Higgledy balls heal MP a little. 4292232374:High chance of confusing enemies. 87665724:High chance of freezing enemies. 773128191:High chance of poisoning enemies. 2018400377:High chance of putting foes to sleep. 1964049445:Huge damage boost at max. MP. 4217059332:Huge damage boost when almnt. in efct. 2091337742:Huge damage boost when HP is low. 632971600:Huge dmg. boost vs. dragons. 2451956776:Improves physical & magical defense. 3480466809:Improves physical & magical defense. 336123836:Increases chance of successful stealing. 4216594918:Increases maximum MP by 1. 843110459:Increases MP use and spell damage. 1717354980:Increases the amount of HP restored. 3787775275:Increases the amount of MP restored. 219408125:Invulnerable for longer when dodging. 2460559650:Loads less damage taken at low HP. 2250495395:Lots likelier to inflict status ailments. 1262472242:Mag. Def. boosted when HP low. 764423057:Mag. Def. greatly boosted when HP low. 2983208120:Magic boosted when HP low. 4270961279:Magic greatly boosted when HP low. 3237101340:Makes critical hits slightly more likely. 1223403958:Makes critical hits slightly more likely. 3655929437:Makes critical hits more likely. 1227473793:Makes critical hits more likely. 1584468626:Makes critical hits much more likely. 28627086:Makes critical hits much more likely. 574689310:Many more treasure chests appear. 3795274793:Massively increases critical hit chance. 3373932522:Melee attacks restore masses of MP. 1357373396:Melee boosted at max. MP. 2076871703:Melee greatly boosted at max. MP. 1407620932:Melee greatly boosted when HP low. 3565063051:Melee strikes boosted when HP low. 3589034070:More likely to inflict status ailments. 4131987756:More likely to inflict status ailments. 1112698938:MP is gradually restored during battle. 1404446382:MP is gradually restored during battle. 3814149734:Much likelier to inflict status ailments. 4015132781:Much likelier to inflict status ailments. 195066008:Plenty less damage taken at low HP. 214809729:Ranged attacks boosted at max. MP. 2512710971:Ranged greatly boosted at max. MP. 2600302459:Ranged greatly boosted when HP low. 1258137093:Ranged strikes boosted when HP low. 3489738411:Reduces MP cost of all spells by two. 834931797:Reduces MP used for special moves. 4175424618:Reduces MP used when casting spells. 1632987448:Slight chance of confusing enemies. 923782846:Slight chance of freezing enemies. 3834366894:Slight chance of poisoning enemies. 1249393403:Slight chance of putting foes to sleep. 1906735247:Slight dmg. boost vs. brutal monsters. 4012201217:Slight dmg. boost vs. dragons. 365608331:Slight dmg. boost vs. elite soldiers. 1133517325:Slight dmg. boost vs. fairy monsters. 244789907:Slight dmg. boost vs. nature monsters. 1794897815:Slight dmg. boost vs. slimy monsters. 670883593:Slight dmg. boost vs. soldiers. 1489868053:Slight dmg. boost vs. solid monsters. 4101560857:Slight dmg. boost vs. tainted monsters. 2614228117:Slightly boosts all elemental resistances. 3618303503:Slightly boosts critical hit damage. 1475245832:Slightly boosts critical hit damage. 995762527:Slightly boosts money dropped by foes. 3127020124:Slightly boosts resistance to all ailments. 1488638073:Slightly boosts resistance to confusion. 3597173816:Slightly boosts resistance to confusion. 2422430321:Slightly boosts resistance to freezing. 2870964349:Slightly boosts resistance to freezing. 2835972046:Slightly boosts resistance to nixing. 3355154368:Slightly boosts resistance to poison. 4094664565:Slightly boosts resistance to sleep. 4064395616:Slightly more treasure chests appear. 3363446181:Some MP restored when taking damage. 1738451923:Some MP restored when taking damage. Found time to fix Pox's Equipment Editor and Infinite Skirmish Might. I don't think I will have time to fix anything else for now. I am leaving on vacation and will be out of pocket until next year. Using Infinite Items Cheat will result in any equipment tabs in inventory unusable. Further more the effect cannot be reversed just by loading the old save files. But you can still equip it in character pages. I got into something even more interesting. I have an 1.0 save files, and after using the cheat that i mentioned above, switching to 3.0 version of the game will result in locking all the means to change equipments/spells except weapons. Does anybody know why some buffs won't stick. After loading a game they are gone. 2. Greatly Boost resistance to all elements. For the session everything is fine and working as it should. Just when I load up a save with said changes, they are gone. This does not apply to all gear. Some boots will take some of the changes whereas others won't. I guess I would like to know if anybody found out what sticks to what. Store bought unique gear will cause that issue. Use other gear.